It seems absurd to those who still associate him with Daredevil, J-Lo and Gigli, but when our backs were all turned, Ben Affleck became a Serious Filmmaker. That’s not the same as saying he just decided to make Serious Films; it’s easy enough to jump onboard projects that seem pre-packaged with prestige. Instead, he launched his career as a director with low-key, character-based genre fare—tense crime-fiction narratives that were also smart, efficient and restrained. Throw in the impressive résumé-building detail that he guided two Oscar-nominated performances in his first two films as a director—Amy Ryan in Gone Baby Gone and Jeremy Renner in The Town—and the transformation seemed complete. When “a film by Ben Affleck” was making its way to theaters, people wouldn’t be rolling their eyes; they’d be sussing out the prospects for gold statuettes. 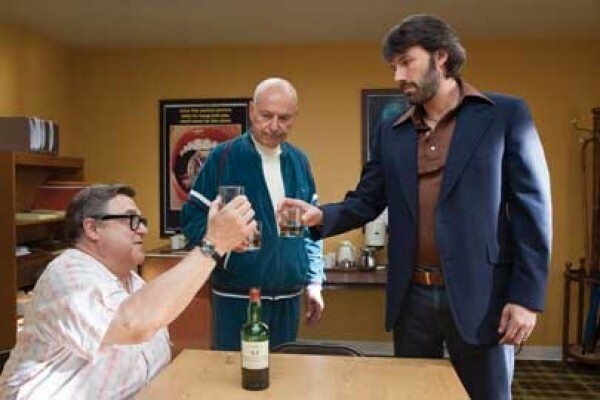 It is crazy—and funny—and some of Argo’s most satisfying moments come from Mendez working with his Hollywood contacts to set up a convincing fake movie. Alan Arkin gets the juiciest material as a veteran producer whose expertise manifests itself in a savvy negotiation with the company that owns the rights to the script they want. Affleck also directs a terrific sequence cutting between a staged press event for the beginning of the fake Argo production, and the ratcheted-up rhetoric of the Iranians holding the hostages in the U.S. embassy, emphasizing the different ways in which the press becomes the mouthpiece for those wanting to sell a story. For a film that’s got to shoehorn in a mess of politics and history, Argo generally clicks along with satisfying, crowd-pleasing style. What Affleck doesn’t have here is a screenplay with a ready-made structure like the novel adaptations he had for Gone Baby Gone and The Town. That’s a problem when it’s deemed necessary to give Mendez some kind of personal back-story, specifically a young son and an estranged wife. The subplot feels like a forced attempt at making his mission more “personal,” perhaps somehow connected to the long night of soul searching we see when he’s informed that the government is shutting down the operation for fear of jeopardizing the planned military rescue of the other American hostages. At the point where the narrative should be getting most focused on the logistics of the escape, Argo simply feels cluttered as it bounces between Mendez and his charges, the suits in Washington (including Bryan Cranston as Mendez’s boss) trying to get the mission re-approved, the producers in Hollywood waiting for a call to support the cover story, and Iranians trying to reconstruct shredded documents to see if they can identify whether any Americans are missing. But when it matters most, Affleck nails the scenes that require building maximum suspense. The “location scouting” trip to the Tehran Grand Bazaar captures the anxiety of the fake Canadian filmmakers with minimalist intensity as locals stare suspiciously at any North American face; the navigation of the gauntlet of security at the airport builds to a wonderful moment in which the American who most doubted the mission winds up selling the fake Argo plot to guards by giving it a twist that resonates with their philosophy. Affleck as a director may not be able to overcome every limitation of his raw material, but he’s got an enviable skill set as a filmmaker: rendering anxiety as action, and turning difficult stories into mass-market entertainment. And he can do it while making you forget about Gigli.